Another look at the Witchblade legend - a new creative tram - quite good. 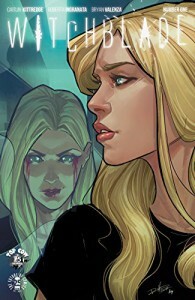 This latest look at the Witchblade brings us a new possessor of the Witchblade with all her problems and doubts. It introduces a whole load of subordinate characters and the whole thing works well even if the reader is not familiar with previous incarnations. The plot moves along at a reasonable pace and the illustrations are not as refined as in previous series but are still of good quality. Quite good stuff – and now on to Volume 2.